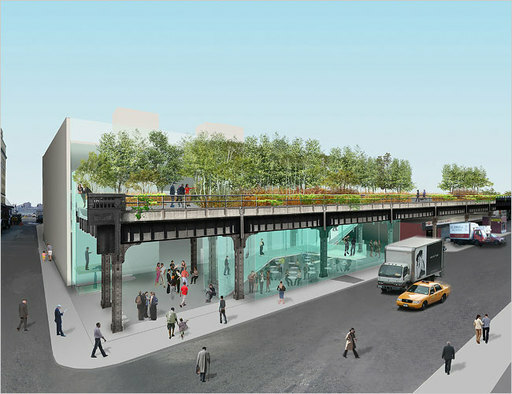 A rendering of the preliminary design for the High Line by Field Operations and Diller Scofidio + Renfro. Courtesy the City of New York. With no director and a board in flux, the Dia Art Foundation has scrapped its plans to open a museum at the entrance to the High Line, an abandoned elevated railway line in Manhattan. The area, running from Gansevoort Street to 34th Street, is to become a park with the help of city money. Nathalie de Gunzburg, Dia's new board chairwoman, informed the city of the decision yesterday in a letter to Kate D. Levin, New York's cultural affairs commissioner. "Dia's board has decided that the organization should take a different course at this time," she said. Reached by telephone, Ms. Levin said that other cultural organizations had approached the city about the High Line site, but she declined to specify which ones. Officials familiar with the High Line discussions said that the Whitney Museum of American Art had emerged as a high-profile contender. Trustees at the Whitney are mulling whether to proceed with an addition designed by the architect Renzo Piano, those officials said. That plan calls for a series of glass bridges to connect the museum’s original 1966 Marcel Breuer building on Madison Avenue at 75th Street to a new nine-story tower. The officials said they did not want to be quoted for fear of being perceived as pre-empting a decision by the Whitney board. Asked whether the Whitney was considering backing out of the Piano expansion in favor of a site at the High Line, a museum spokeswoman, Jan Rothschild, said yesterday, "The Whitney is keeping its expansion options open," adding, "We are considering several sites for additional space and have had discussions with the city about the Gansevoort/Washington site."